I have at last begun to relax again and enjoy my life as it is at the moment and that is no bad thing. There was knitting before Christmas but it was a little bit pressured and because of that I didn’t take careful notes of wool used or even take enough photographs. I made my sons a Christmas hat a piece. 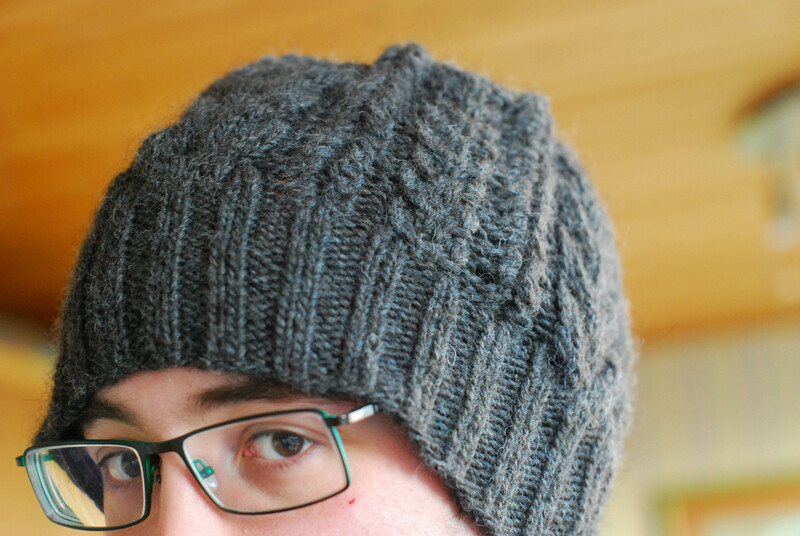 I knitted them both, but in different yarns and colours Bray Cap by Jared Flood. I absolutely adored this pattern and intend to make one for myself for next winter and I think my boys loved them too. And now my fingers are twitching to continue as they have started. And before I get into a big bout of startitus I am reigning myself in before it all gets out of hand. So to that end one of my new year resolutions this year is to finish all of my started projects, or at least to frog them or recycle them if they no longer hold the promise they once did. I started this particular cardigan over a year ago. Gnarled Oak Cardigan by Alana Dakos in Coastal Knits. Knitted in Wollmeise DK colourway Petit Poison Nr. 5 Dark. I’ve loved knitting with this wool, its smooth, soft and strong and has a wonderful stitch definition and did I mention the colour, oh the colour is dark and gloriously rich. it is a thing of beauty and one that I will be sad to finish. I certainly don’t knit with the speed and vigour that I once did when I started out on my journey of learning to knit, I just plod along and enjoy every stitch and what more is there to say. Apart from, enjoy your knitting. This weather, which is bleak and cold, is just the best time to spend doing a little knitting. I agree with you that a ‘little’ knitting is very relaxing. I’m happy you’re knitting again. There’s nothing quite like it for what ails you! I’m just happy you’re happy and at relative peace again. My fingers are so painful lately that knitting really hurts but I give them a rest then start again. I have eighty granny squares done and plod along slowly at that too.